AVAILABLE IN PRINT AND DOWNLOADABLE EBOOK, AMAZON KINDLE, BARNES & NOBLE NOOK, AND IBOOKS. Gary Schmidt, a small-town American boy, meets a Japanese girl in college and follows her to Japan to start a family. Little does he know that her conservative Japanese clan has hidden agendas and secret intentions. Gary eventually realizes that he must escape their clutches – and convince his family to do the same before it's too late! IN APPROPRIATE is a book about child abductions in Japan, where after a divorce, a non-Japanese man comes back to Japan to retrieve his children back to America. Although a work of fiction, it is an amalgam of several true stories of divorce and Left-Behind Parents in Japan. Debito adds: "IN APPROPRIATE is about more than just divorce: I wanted to describe how a person would find fascination in Japan and Japanese people, come over during Japan's Bubble Era to see Japan ripe with opportunity, and find how Japan went sour as an economy over the past two decades. It was wonderful to recount as a Bubble-Era veteran -- when in the late 1980's Japan looked poised to take over the world, and even challenge notions of how capitalism works -- and see how, step-by-step, Japanese society would be squeezed and squeezed, convinced that recovery was right around the corner just like Godot. How a person could assimilate himself to the point of founding his own company, becoming bilingual in Japanese, even taking Japanese citizenship, yet be blindsided by events that were nearly always beyond his control. IN APPROPRIATE is also a time capsule charting Japan's descent into mediocrity and comparative international irrelevance." Preview the first 11 pages of IN APPROPRIATE by clicking here. Under book cover, click "Preview". Complimentary copy now available at the Foreign Correspondents' Club Library (FCCJ) in Tokyo. Save shipping costs if you're in Japan! On sale at Amazon Japan. PRAISE FOR NOVEL "IN APPROPRIATE"
"Novels about Japan are a dime a dozen, but rarely is there one that takes the reader on a journey that is not only unique but also has a real social message attached to it. IN APPROPRIATE does just that -- it transports the reader to a side of Japan that few ever get a chance to read about in a novel, even more rare in the mainstream media, and it offers insight into an issue regarding Japanese society that has been largely ignored by the publishing elite in print and film. I especially appreciated the historical references sprinkled throughout which gave the reader a clear understanding of the itme period and social condition of Japan, which helps to explain the main character's behavior and that of his wife and in-laws... (read full review). -- Dr. Todd Jay Leonard, author of An Indiana Hoosier in Lord Tsugaru's Court, East Meets West, et al. "Finished IN APPROPRIATE last night. Books on Japan can sometimes be a real chore to get through, but ARUDOU Debito writes fluidly and smoothly. It also helps that he clearly has a thorough grasp of the subject matter, based on his own experiences and those who he has met and worked with over the years. It's a well-constructed story which highlights a number of important issues regarding the rights of Non-Japanese in Japan, with more than a few pointers for anyone considering setting up here. Thankfully, my experience with Japan is very different to that described in the novel, and I don't think the book is intended in any way to represent a "typical" experience. But it graphically brings home what can happen if things don't work out. Recommended." -- Steve King, Facebook review. "A short, quick read regarding Japan's unfavorable custody laws for foreigners, particularly men, divorced from Japanese. Interesting in that neither of the book's two main characters, Gary and Keiko, fall into the classic antagonist or protagonist roles; both seem flawed and selfish in their own cultural ways, but seemingly harmless -- until the convention nuclear family unit is totally destroyed; there are no heroes. The characters are who they are, warts and all... Overall, an interesting read for those curious about Japan. -- Albrecht Stahmer, Amazon.com review (read full review). "ARUDOU Debito's depiction of how quickly life gets turned upside down by the crazy family rules in Japan will do more than just grab your attention. It will make you cry at the strange and deplorable tale of love lost in Japan. IN APPROPRIATE sheds necessary light on the twisted norms and laws in Japan that not only allow, but also encourage parents to abduct their children from one another. A must-read primer on the issue." -- Eric Kalmus, Children's Rights Network Japan (www.crnjapan.net), and Left-Behind Parent. 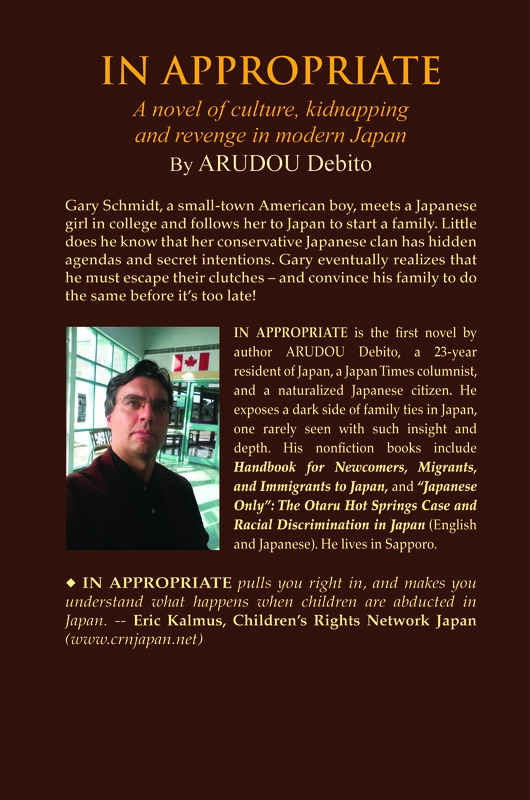 "IN APPROPRIATE by ARUDOU Debito is a work of fiction, full of fact... I read the book twice; once to check the facts and once to feel the emotions. There is no other way to describe this but say that on both fronts, the book hits home. Many people reading this will not believe it, but as somebody that has 'been there and done that"' I can honestly say this is one of the most powerful books I have ever read... If an inside, in-depth view of Japan is what you are after, then this book is for you." -- John Evans (updated recommendation via LinkedIn). Sound too good to be true? Then read a mixed but very thoughtful review of IN APPROPRIATE from Amanda Harlow of BeingABroad.com here. 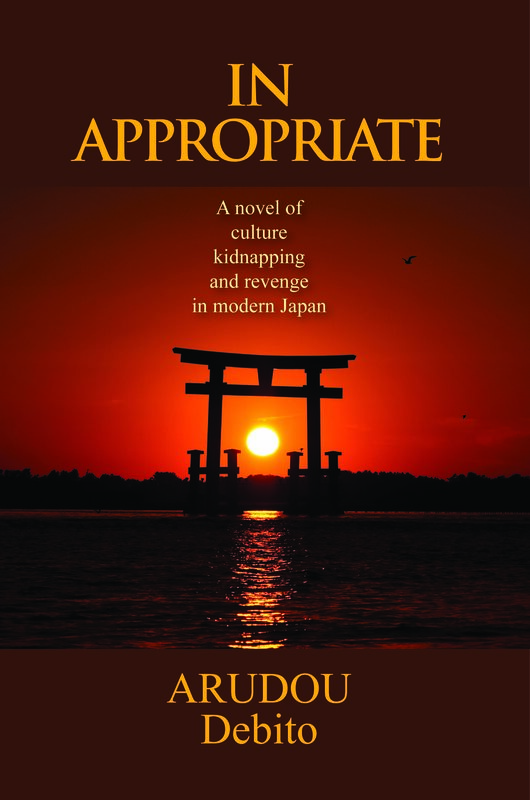 "IN APPROPRIATE: A novel of culture, kidnapping, and revenge in Japan"
Buy from Amazon.com by clicking this link. Or from Barnes and Noble by clicking this link. Also on sale at Amazon.co.uk and Amazon Canada (as well as all other nationalities of Amazon). Save shipping costs if you're in Japan! Buy from Amazon Japan. This should be downloadable at major online retailers (it takes a while for it to be listed) by now for reading on your iPad, Kindle, etc. If you see it come online, please let me know! 5) REGULAR BOOKSTORES (at prices they assess). The paperback book has an ISBN (978-1-257-02640-1), so it can be ordered from any brick-and-mortar bookstore. Take the number to the clerk and put it on order. I hope you enjoy my novel IN APPROPRIATE. I enjoyed writing my first fiction work. If you like it, please consider recommending it to others. Your support will enable me to write more novels and continue on in this direction. Read my other nonfiction books here.